This is the final chapter on my 4 part series looking at some of the best cider from New Zealand that I could find in Australia. Today I return to Zeffer’s cider house to review the Zeffer Dry Crisp Apple Cider. Only problem is it’s now called Zeffers Crisp Apple Cider. If you haven’t seen it yet, Zeffers have one of the prettiest websites I’ve seen in a while. The eagle eyed may notice that the Dry Cider isn’t on the website. Zeffer’s Dry Cider has recently had a bit of a facelift and is known as the Crisp Apple Cider. This was the first cider the company brought to the public. Marketed as the hot summers day cider being fresh and crisp. There is a bit of a caveat to this review. I tasted the Dry Cider, the Crisp Apple name has now been out for a little while. So I can only assume the the couple of bottles I tasted may have spent a few months on the shelf. If stored properly, a cider can last 2 or 3 years. However, the cider can darken and the flavor can go in the direction of an apple pie. At the time I purchased these bottles I didn’t know about the branding change. Rich full nose of baked apple. There own website describes it as “Clean, green apple aromas.” I’m starting to think there might have been some aging happening here. A very small sharp bead lets your tongue be wrapped in a light, dry coat of baked apples. 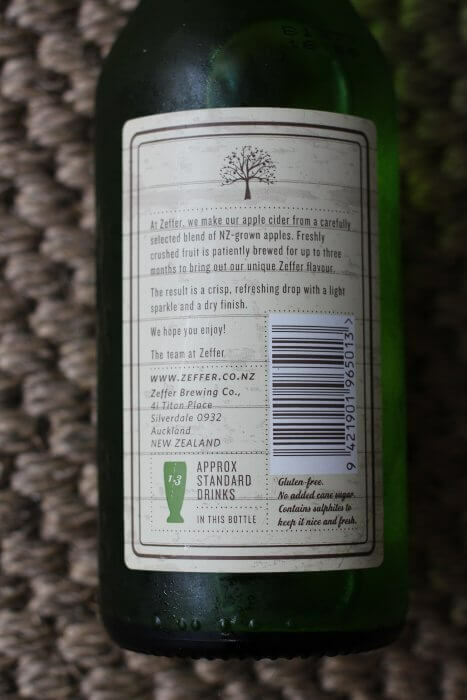 Imagine a Granny Smith apple crumble baked without sugar then turned into cider and you’d be pretty close the Zeffer’s Dry Cider. Slight spiciness create a warming cider not necessarily a crisp finish. Yes, this cider may have mellowed from the crisp summer refresher that it is advertised as, now the Zeffer Dry Crisp Apple Cider is a dry but mellow cider. I couldn’t say that it better or worse that what Zeffers intended the flavor to be, it’s just different. It is still tasty, dry easy to drink, a good quality cider. The title of the best cider out of Zeffer’s cidery still goes to Slack Ga Girdle. I’m going to keep an eye on out for the new branding at my local bottle shop to see when the labels changes. I try and grab a couple more stubbies and see if the taste is closer to Zeffers description. Should be an interesting little experiment.